This recipe for non-alcoholic Wassail is from Dorothy Morrison's book Yule A Celebration of Light and Warmth. 1. Preheat oven to 325 degrees F. Grease and flour 2 large cookie sheets. 2. Cut almond paste into 1-inch chunks. In small bowl, with mixer at low speed, beat almond paste until crumbly. Add sugar and egg whites; beat until well blended (dough will be sticky and wet). 3. Place almonds on sheet of waxed paper. With lightly floured hands, roll 1 level tablespoon dough into a 3-inch-long log. Place dough log on almonds; gently press and stick almonds into dough to cover. Repeat with remaining dough and almonds to make 24 logs in all, placing logs on cookie sheets, about 1 inch apart, as they are formed. 4. Place cookie sheets on 2 oven racks. Bake logs 20 to 25 minutes until golden and set, rotating cookie sheets between upper and lower racks halfway through baking time. Remove logs to wire racks to cool. Store in tightly covered container. Each log: About 135 calories, 4 g protein, 13 g carbohydrate, 8 g total fat (1 g saturated), 0 mg cholesterol, 7 mg sodium. 1. Preheat oven to 350 degrees F. Grease large cookie sheet. In large bowl, with wire whisk, beat egg whites, confectioners' sugar, and flour until blended and smooth. Beat in melted butter, anise extract, and salt. 3. Bake cookies 5 to 7 minutes until edges are golden. With pancake turner, quickly remove 1 cookie to wire rack. With hands, gently shape warm cookie to flute edges. Repeat with remaining cookies on cookie sheet. If cookies become too hard to shape, return cookie sheet to oven to soften cookies slightly. Repeat with remaining batter. (Batter will become slightly thicker upon standing.) Store in tightly covered container. Each cookie: About 40 calories, 1 g protein, 5 g carbohydrate, 2 g total fat (1 g saturated), 6 mg cholesterol, 45 mg sodium. 1. In large bowl, with mixer at low speed, beat margarine or butter with cream cheese until blended and smooth. Beat in vanilla extract, salt, 1 cup flour, and1/4 cup sugar until blended. With spoon, stir in remaining flour. Divide dough into 4 equal pieces. Wrap each with plastic wrap and refrigerate until firm, at least 2 hours or overnight. 2. Prepare filling: In medium bowl, with spoon, stir walnuts, apricots, brown sugar, 1/4 cup plus 2 tablespoons sugar, and 1/2 teaspoon cinnamon until well mixed. Line 2 large cookie sheets with foil; grease foil. 4. Preheat oven to 325 degrees F. In cup, mix remaining 2 tablespoons sugar with 1 teaspoon cinnamon. With pastry brush, brush rugelach with milk. Sprinkle with cinnamon- sugar. 5. Bake rugelach on 2 oven racks about 30 to 35 minutes until golden, rotating cookie sheets between upper and lower racks halfway through baking time. Immediately remove rugelach to wire racks to cool. Store in tightly covered container. 1. Preheat oven to 325 degrees F. Into large bowl, measure all ingredients. With hand, knead ingredients until blended. 2. Pat dough into ungreased 13" by 9" metal baking pan. Bake 30 minutes or until edges are golden. 3. Remove pan from oven; immediately cut lengthwise into 4 strips, then cut each strip crosswise into 4 pieces to form 16 bars. Cut each bar diagonally in half to form 32 triangles. 4. Cool cookies in pan on wire rack. When cold, carefully remove cookies from pan. Store in tightly covered container. Each cookie: About 100 calories, 1 g protein, 15 g carbohydrate, 4 g total fat (0 g saturated), 0 mg cholesterol, 90 mg sodium. 2. Preheat oven to 350 degrees F. In large bowl, with mixer at low speed, beat almond mixture, flour, butter, almond extract, salt, and egg just until blended, scraping bowl occasionally with rubber spatula. 3. 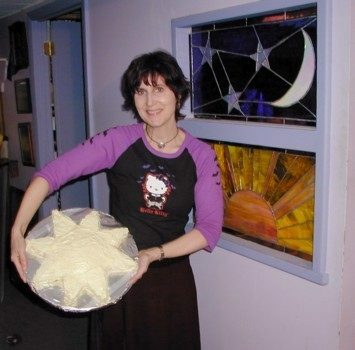 Spoon dough into large decorating bag with large star tube (about 3/4 inch in diameter). Pipe dough into teardrop shapes (about 2" by 1 1/2"), 1 inch apart, onto 2 ungreased large cookie sheets. 4. Place cookie sheets on 2 oven racks. Bake cookies 12 to 14 minutes until lightly browned around edges, rotating cookie sheets between upper and lower racks halfway through baking time. Allow cookies to cool slightly on cookie sheets. With pancake turner, remove cookies to wire racks to cool completely. Repeat with remaining dough. 5. When cookies are cool, prepare Chocolate-Raspberry Filling. With small spatula, spread about 1 rounded teaspoon filling onto flat side of half of cookies. Top with remaining cookies, flat-side down, to make filled cookies. CHOCOLATE-RASPBERRY FILLING: In 1-quart saucepan over low heat, heat 1/4 cup plus 2 tablespoons heavy or whipping cream, to boiling. Meanwhile, finely chop six 1-ounce squares semisweet chocolate and place in small bowl with 3 tablespoons seedless raspberry jam. Pour hot cream over chocolate mixture; let stand 1 minute. Stir chocolate mixture until smooth. Refrigerate until chocolate mixture is firm enough to spread, about 15 to 18 minutes. If mixture becomes too firm, let stand at room temperature until slightly softened. Each filled cookie: About 165 calories, 2 g protein, 18 g carbohydrate, 10 g total fat (5 g saturated), 28 mg cholesterol, 85 mg sodium. 1. Preheat oven to 400 degrees F. In food processor with knife blade attached, blend flour, shortening, margarine or butter, 1/4 cup sugar, and 1/4 teaspoon salt, pulsing processor on and off until crumbs form. With processor running, through feed tube, add 2 to 3 tablespoons cold water, 1 tablespoon at a time, pulsing processor on and off until dough comes together. 2. Press dough onto bottom and 1/4 inch up sides of a 13" by 9" metal baking pan. With fork, prick dough in many places to prevent puffing during baking. Bake 15 to 20 minutes until lightly browned. Remove crust from oven. Turn oven control to 375 degrees F.
3. Meanwhile, in medium bowl, with wire whisk, beat sour cream, eggs, 1 cup sugar, and 1/8 teaspoon salt until well mixed. Mix in lime and lemon juices, and lemon peel until blended. 4. Pour citrus mixture over warm crust in pan; bake 15 minutes or until just set (do not overbake or citrus filling may crack). Remove pan to wire rack; cool completely in pan. Refrigerate. 5. To serve, when cold, sprinkle with confectioners' sugar. Cut lengthwise into 4 strips; cut each strip crosswise into 8 pieces. To store, cover pan and refrigerate. 1. In large bowl, with mixer at medium-high speed, beat butter, sugar, milk, coconut extract, baking powder, and salt until light and fluffy. With wooden spoon, stir in flour and chopped coconut (dough will be a bit crumbly). With hands, squeeze dough together. 2. Divide dough into 4 equal pieces. Shape each piece into a 10" by 1" log. Wrap each log in plastic wrap and slide onto small cookie sheet for easier handling. Refrigerate dough at least 1 hour or until firm. 3. Preheat oven to 325 degrees F. Cut each log into 1/2-inch slices. Place slices, 1 inch apart, on 2 ungreased large cookie sheets. With toothpick, make 4 holes in each cookie to resemble a button. Place cookie sheets on 2 oven racks. Bake cookies 20 to 25 minutes until lightly golden, rotating cookie sheets between upper and lower racks halfway through baking time. Remove cookies to wire racks to cool. 4. When cookies are cool, melt chocolate with shortening. Dip bottom of each cookie into melted chocolate so that the chocolate comes slightly up side of the cookie. With small metal spatula, scrape excess chocolate from bottom of cookie, leaving a thin layer. Place cookies, chocolate-side down, on waxed paper. Set cookies aside to allow chocolate to set. Store cookies in tightly covered container. Makes about 6 1/2 dozen cookies. Each cookie: About 55 calories, 1 g protein, 6 g carbohydrate, 3 g total fat (2 g saturated), 6 mg cholesterol, 45 mg sodium.